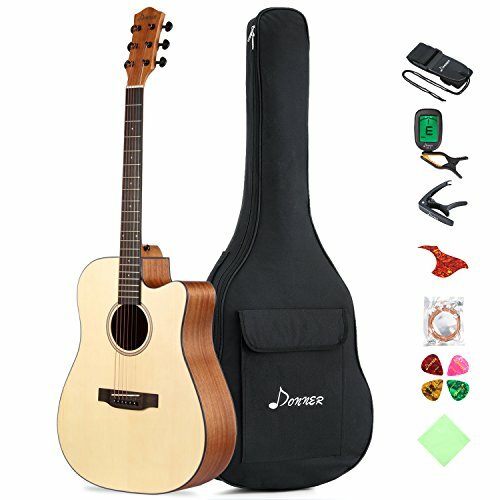 As you can see, the Donner DAG-1C is a great-looking cutaway dreadnought guitar with a big, bold sound and excellent features that represent exceptional value, and features a spruce top with scalloped bracing, mahogany back and sides, chrome tuner keys, a good quality brass strings. The slim neck provide comfortable feel and excellent playability, and the smooth satin finish maximizes resonance for optimal sound quality. 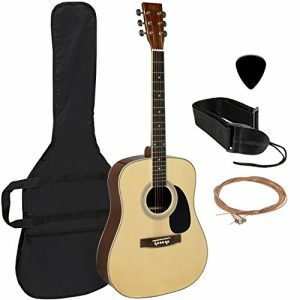 Tuner key is sealed tuning pegs style, alloy metal made and keep your acoustic guitar playing in tune. Bronze strings combines the medium gauge bottom strings for increased resonance and volume with light gauge top strings for more comfortable playability and single note bending. The strings starts with the highest quality wrap wire materials, precision drawn and micro-coated on our advanced proprietary machinery. 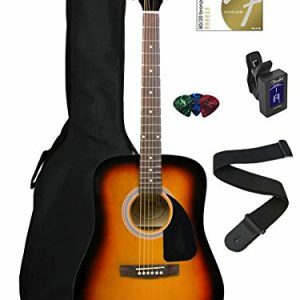 The DAG-1C offers warm, vibrant, sound in your hands at a great price with a choice of convenient and practical features that will have the beginning guitarist in your house strumming away in no time. Pick up it to join in the growing guitar fanfare! Enjoy your own fun and colorful life. 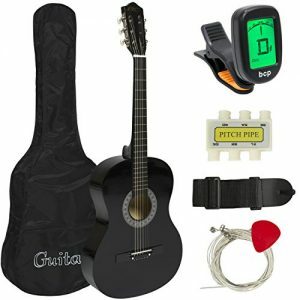 Comes with gig bag, guitar strap, guitar capo, strings, digital clip-on tuner , polishing cloth and guitar picks as gifts.